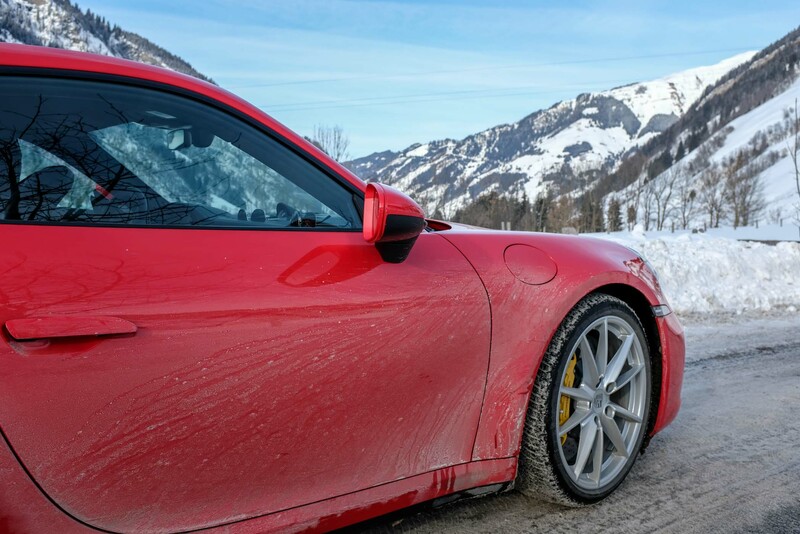 The Porsche Winter Event gave stage to the resurrection of the Ice Race in Zell am See, Austria. 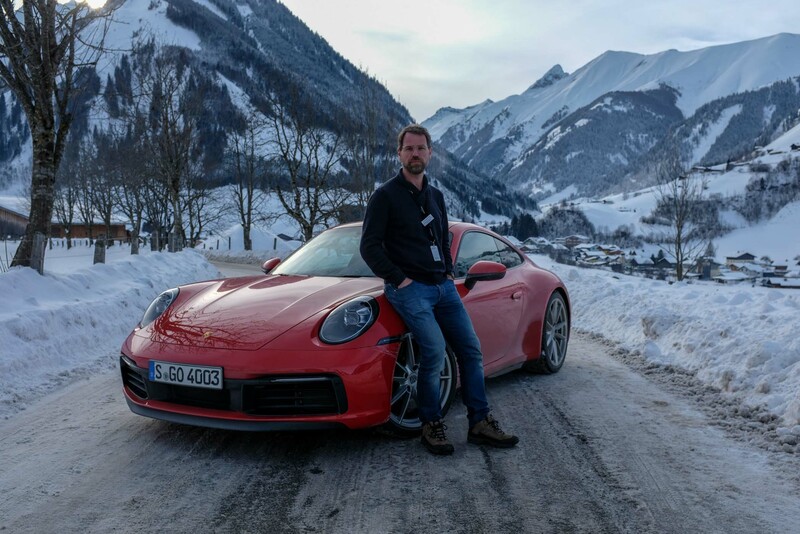 Porsche and Porsche-Design invited me for their Winter Event in Zell am See, Austria. Although it was immediately after the SIHH, from 18-20 January, I couldn’t resist when I saw the programme! 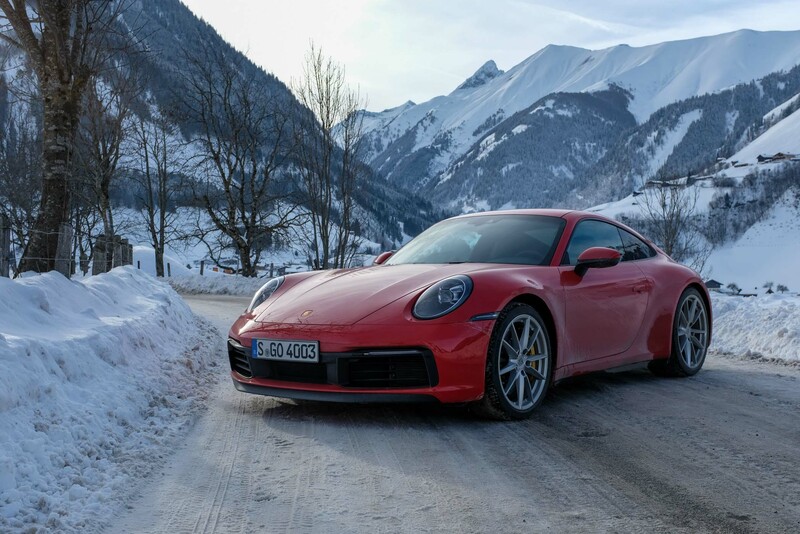 Zell am See is the historical birthplace of Porsche and its design studio is still located in this beautiful Austrian village, in the middle of the Alps. 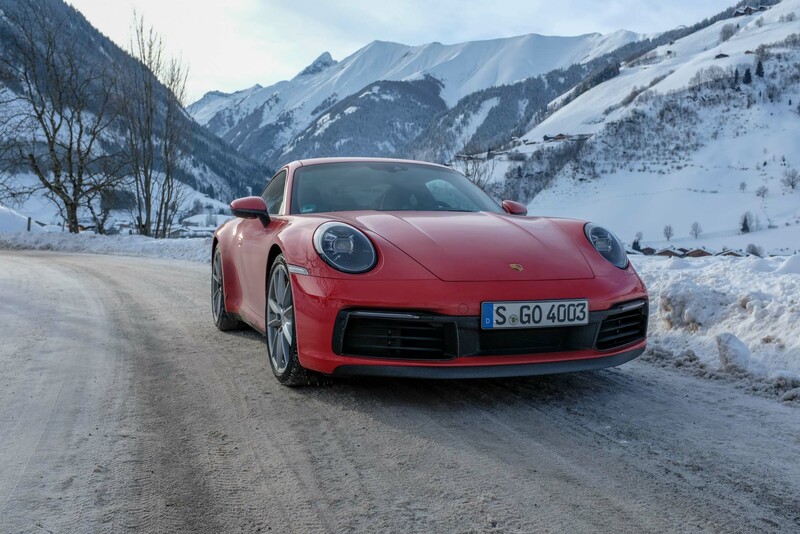 Zell am See gave stage to the revived Ice Race and the new Porsche Design 911 Timeless Machine, which we covered recently, was there for me to review. 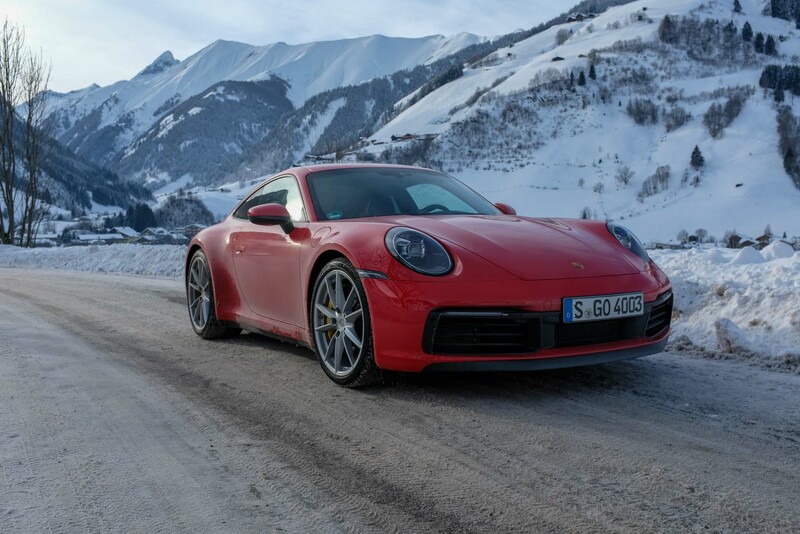 But also another mechanical machine that is also dubbed ‘Timeless Machine’ awaited me and here’s my report on the Porsche Winter Event, the new Porsche Design 911 Timeless Machine Limited Edition and driving the brand new Porsche 992. When I started MONOCHROME it was all about sharing the passion for mechanics on the wrist. That hasn’t changed over the past 12+ years, however, since I’ve attended quite a few sports car events, I must admit that my passion for sports cars has been ignited. And that passion went further than I ever expected when I bought a car instead of a new watch (a 997.1 C2S with a manual gearbox to be precise.) Now I’m a happy camper driving my 911 and when the invitation came to drive the new 992, this was an opportunity I simply couldn’t resist. Doing this with the 911 Timeless Machine from Porsche Design on the wrist just made things even better. First… the watch! Let me not get too much into the specifications of the 911 Timeless Machine, as our editor Erik already covered it when it was introduced. 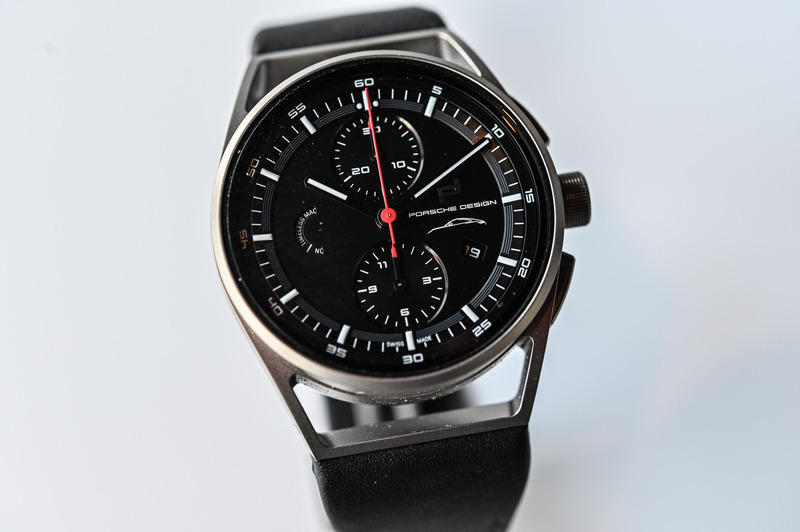 The new 911 Timeless Machine is based on a watch that I like a lot, the Porsche Design 1919 Chronotimer. The design is focused on wearability, legibility and ease of use. The rubber strap and/or titanium bracelet are very comfortable and make the watch sit snug on the wrist. 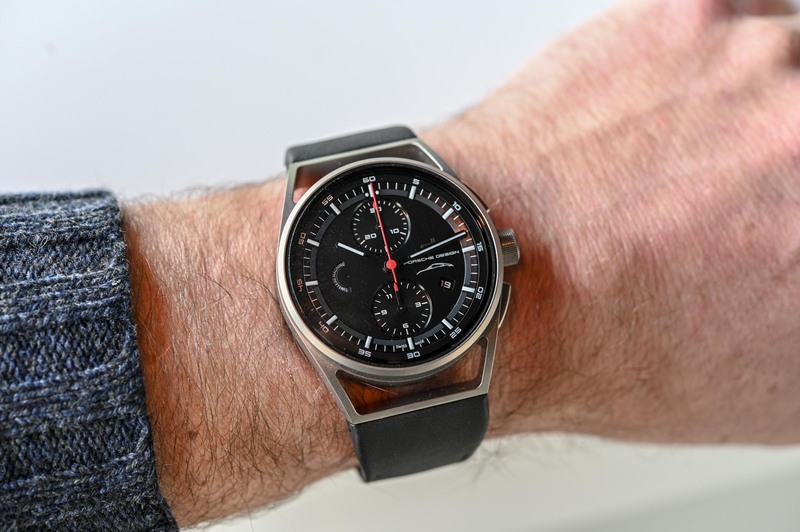 However, on the 911 Timeless Machine, the rubber strap or titanium bracelet have been replaced with leather from the new 911. 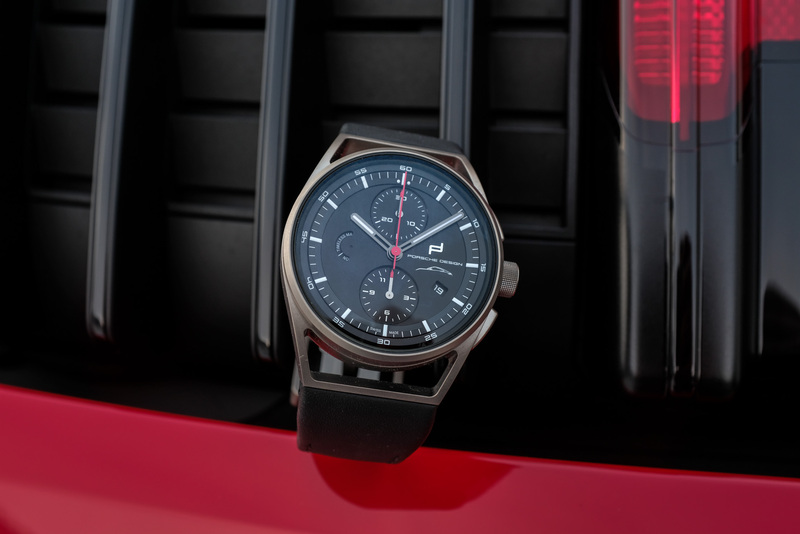 It looks great, feels good on the wrist and the idea to have the same leather around your wrist as the leather used on the 992’s steering wheel or seats is very cool. 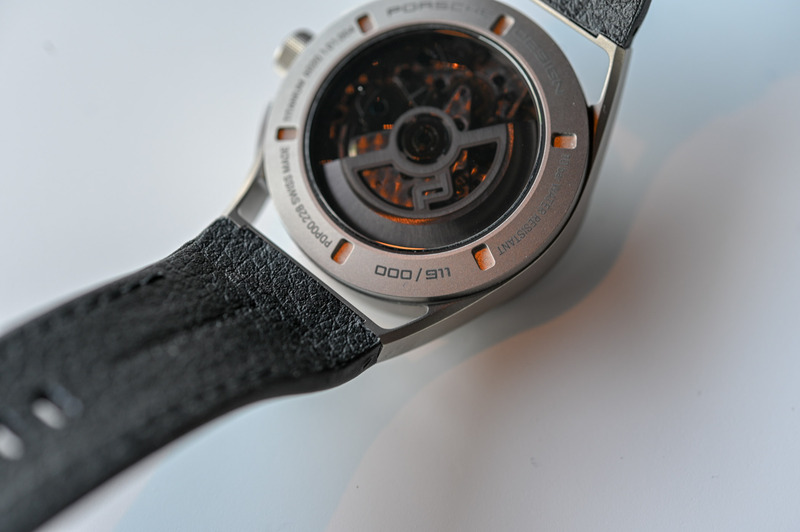 The watch comprises a titanium barrel that holds the movement, dial and hands, and a sort of a lug construction that holds this barrel, which is also made in titanium. On the right-hand side of the barrel are two pushers for operating the chronograph. These pushers are nicely designed and blend in with the curvy shapes of the barrel holder/lug construction. One of those details that matter! Like the crown, which also offers a lot of grip, and the smokey sapphire crystal in the caseback that gives a slightly obscured view on the mechanical chronograph movement. It’s all so well-made, and so well-designed that it doesn’t get boring. 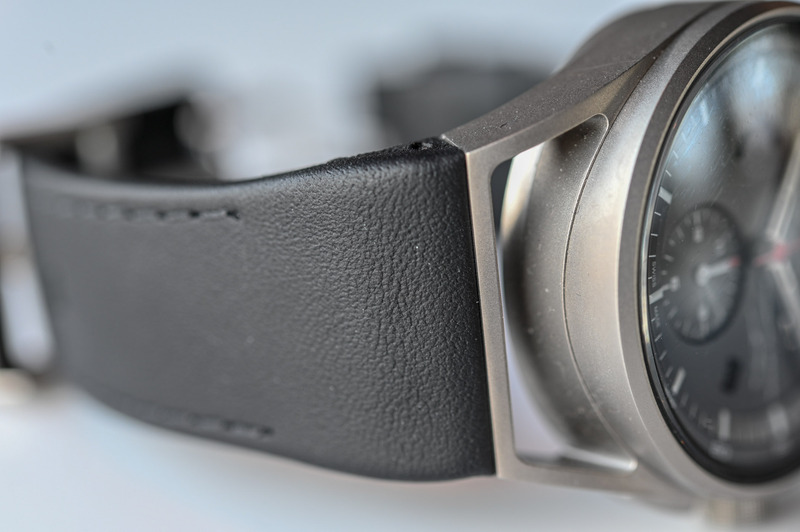 When wearing this watch, there’s always a nice line, or curve, or any other detail that is nice to see. Besides comfort and strong design, the 911 Timeless Machine also excels in legibility. The black dial features white hour and minute markers, white numerals around the dial’s periphery, the brand’s name in white print and a silhouette of the new 992 on the dial. The Porsche Design logo is applied. Subdials at 12 and 6 o’clock are registers for the 30-minute counter and the 12-hour counter, while the latter has a fun little design cue (there’s no 12, but the number 11 printed and combined with the 9… you guessed it). The date is visible through a small square aperture at 4 o’clock and at 9 o’clock is a rotating disc visible through a half round aperture and printed on that disc is “timeless machine”. This disc makes one full rotation every minute, as long as the movement is running, and it serves rather as a ‘sign of life’ than as a classic seconds hand. The entire watch oozes quality and it’s a well-built machine! And that’s exactly what we expect from Porsche; the Germans know how to build a good (sports) car. 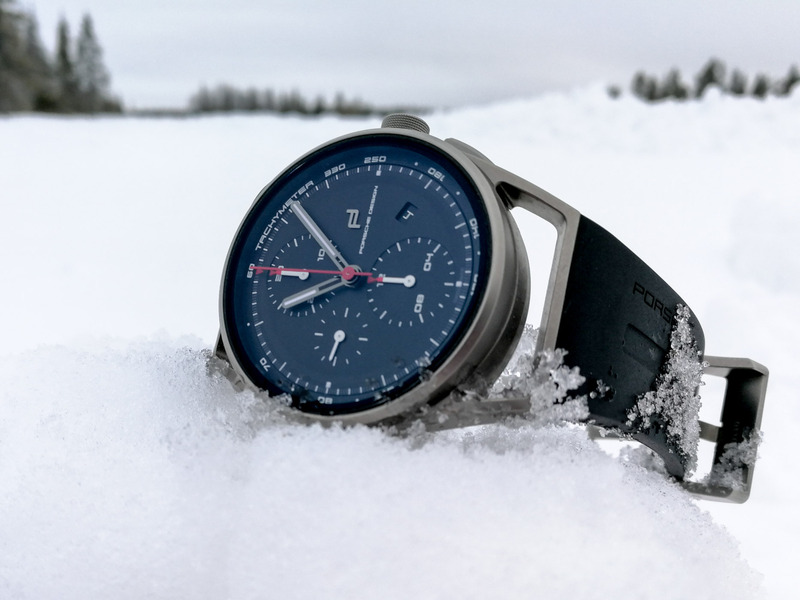 By experience, I can now also say the same about Porsche Design and its watches, although the watches have been built and assembled in Switzerland. 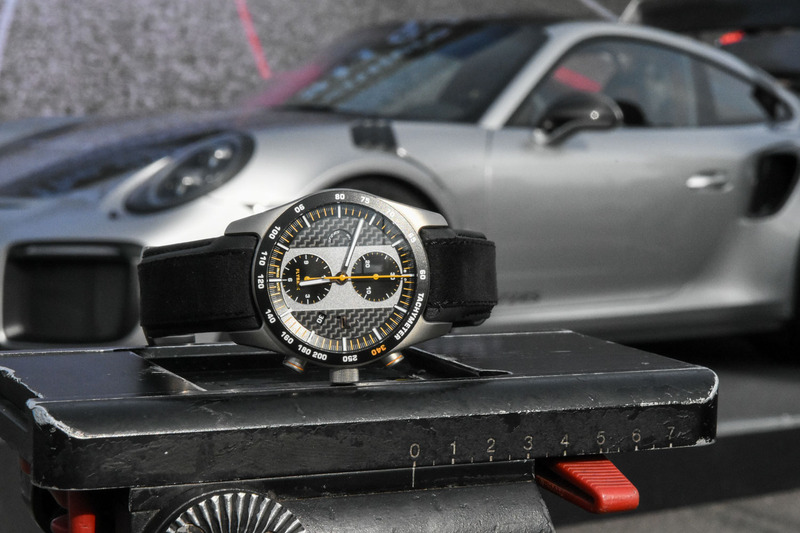 Wearing a new watch might not make my heart beat faster, but I can assure you that the idea of driving the new 992 did! Although I’ve had a bit of experience driving various Porsche cars, my main reference is my own 997 Carrera S, which is equipped with a manual gearbox. When I compare the new 992 to my old 911, it could feel like the difference between night and day, but it doesn’t. When driving the new 992 it still feels like that good ol’ 911 with its strange positioning of the engine (behind the rear axle). However, the new one packs many more electronic safety features than the previous 911 (the 991) and it feels so much more safe and in control. The new ‘wet mode’ certainly helps, but even in ‘normal’ or ‘sport’ mode, the car handles magnificently on snowy and icy roads. We drove on the snowy roads in the Austrian Alps and I tried to break hard with only the two right wheels on the snowy/icy surface, and later I accelerated fiercely with only two wheels on a slippery surface. The result… nothing crazy! Just a well-balanced deacceleration when braking and a smooth acceleration when stepping on the pedal. It felt so safe, so controlled, so smooth! So what are the main differences? The wider wheelbase, both for the front as well as for the rear, makes a big difference. The steering feels more precise, more in control, and the car has a better grip that is probably also due to that wider wheelbase. The engine of the 992 Carrera S that I got to drive packs 450bph, which is 95bph more than my old 997 Carrera S. The funny thing is that you do not necessarily feel like you’re driving an even more powerful sports car. 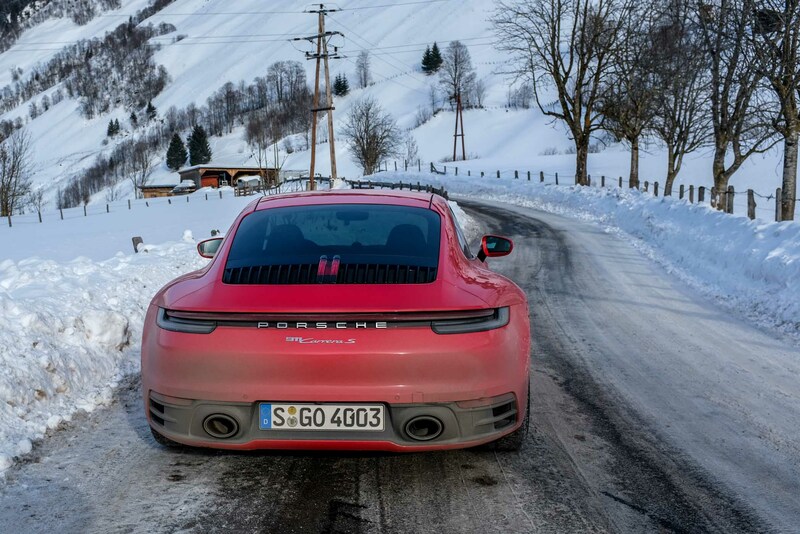 The 992 is so gentle, so ‘polite’, and the power is distributed so perfectly, that the sports car feeling of old 911s and even of my 997 seems a long distance from this model. While the power is brutal and the acceleration is extremely fast, it still feels gentle. The perfect gentlemen’s ride for driving to the office or clients. That is until you put it in ‘sport plus’ mode and unleash the beast. That’s when you will hear the exhaust rumble and a deep roaring sound from the rear becomes a magnificent soundtrack. Going from 991 to 992 is not a revolution but an evolution. Sure, there are small things to nag about, like the cup holders. And the sound is different from my non-turbo charged 997, as it doesn’t howl like an old, non-turbocharged flat-six boxer. But hey, let’s be honest, the 992 is the best 911. 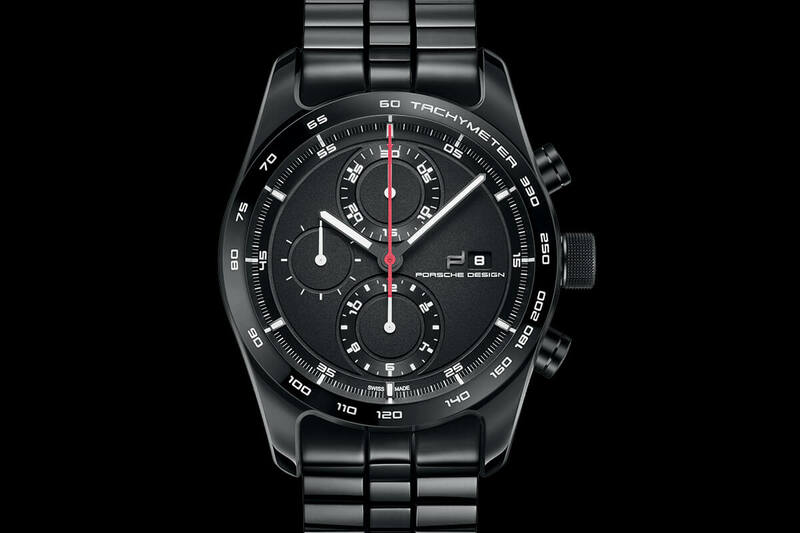 Back to the watch… the Porsche Design 911 Timeless Machine Limited Edition is limited to 911 pieces and is priced at EUR 4,911. That’s only 911 pieces and you can reserve your preferred number! 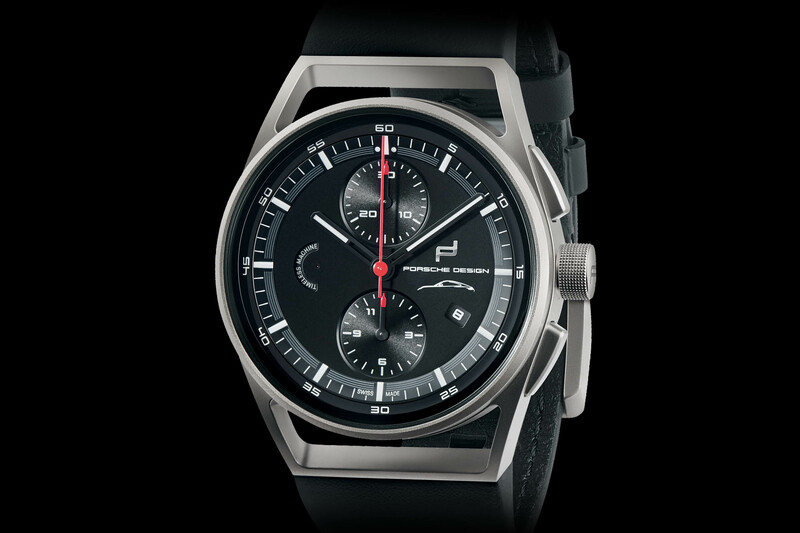 More info here at the Porsche Design website. More info about the Winter Event and the revived Ice Race can be found here gpicerace.com. 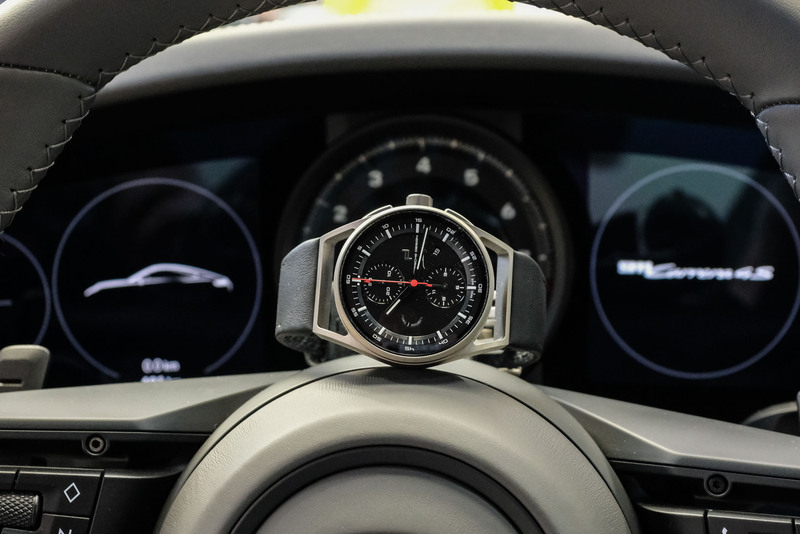 And go to the Porsche website (here) to read more about the 992, to lust over the photos and specs, or to configure your new 992.
a lot of money for a pretty standard ETA movement which can be had for a lot less…I too like my 997…but not enough to 5000E for a watch with that movement. I already have a couple of watches with that movement which cost substantially less and look good. 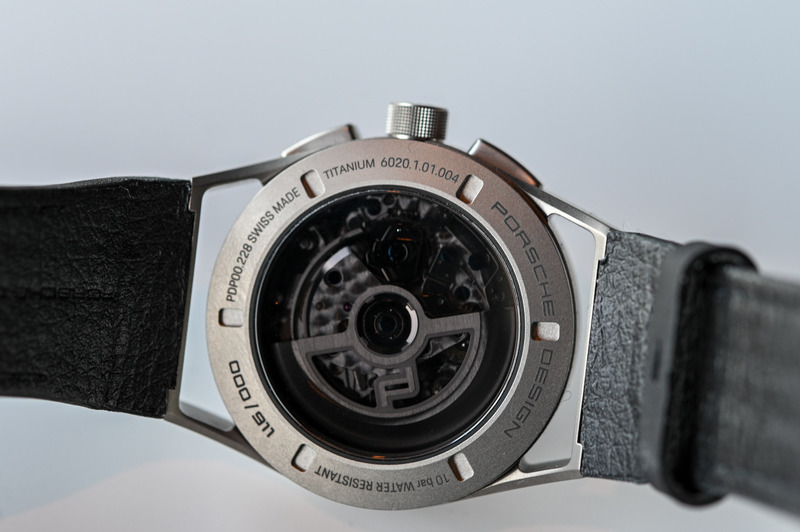 I love the design of the watch but have to agree the price tag is a bit steep for a modified 7750 movement (and presumably the ‘wobble’ that comes with it!) By the way I thoroughly enjoyed my manual 997 as a daily commuter but these days in my dotage I’ve reverted to an air cooled 964 before all the electronics completely took over..
Congrats on your 964, Norman, a great ride! Porsche Design make lots of lovely stuff. They even make tobacco pipes! Which are high quality by the way. I have had a hankering for one of their watches for a while but many of them suffer from Anaemic Date Wheel Syndrome. This one doesn’t. It does however suffer from Putting A Picture Of A Car On The Dial Syndrome, which is much worse! They really need to calm down with this cheesiness. Very few people who drive Porsches are idiots. If it said “Chevrolet: Freedom since 1911”, they might hit the right note with their demographic. As much as I love anything made a germany Porsche should never ever make a watch again. They are so much below average and pointless! Stick to cars where you are the best. Disappointing to see that the author does not understand the difference between track and wheelbase. Just like a good portion of Porsche owners, who pay up for capability they don’t understand and will never use. The watches, too, are a perfect match with their over-designed and overpriced construction. I used towork for The RAC. The only people who had a clue were bikers and Porsche drivers. Maybe where thk lives it’s different. Cool watch in the context of that car and the overall Porsche brand. However, when trying to assess the watch by itself, without that marketing ‘halo’, it’s sort of … meh to me. Considering Porsche is part of the VAG family and they already are producing Breitling for Bentley line; perhaps a run of Porsche timepieces are in order. These watches seem to be a lot of marketing and profit for not a lot of watch. In my humble opinion and experience around these cars you’re basically getting something to resell with the car once the novelty of both wear off. 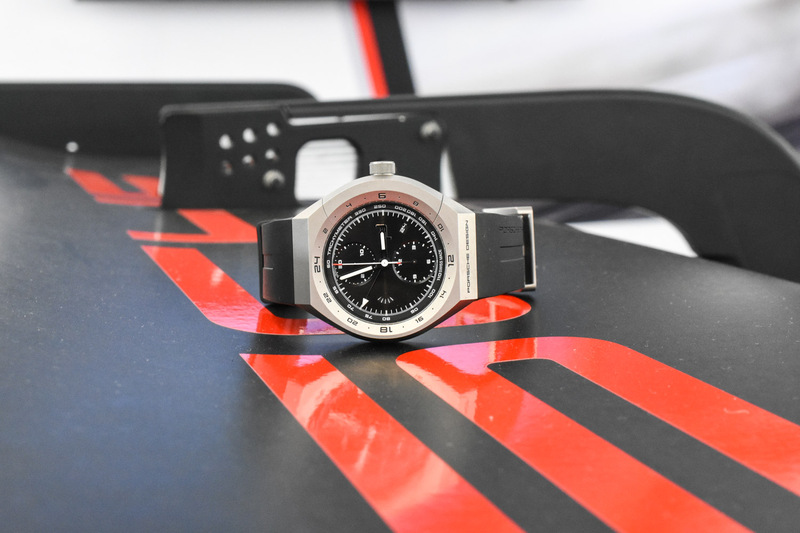 @Mark Jawdoszyn… Breitling for Bentley is a collaboration between Breitling and Bentley and has nothing to do with Porsche owning Porsche Design, and Porsche Design creating their own watches. To be frank, Breitling for Bentley is something they shouldn’t have done, it hurts my eyes. 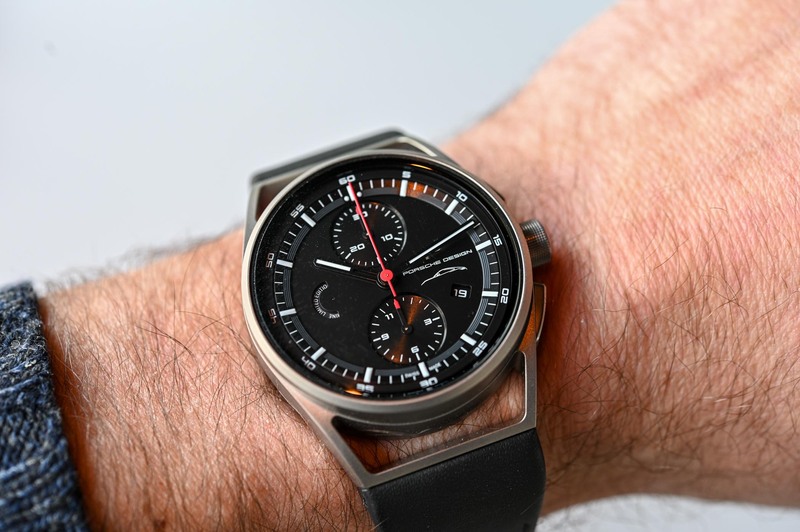 But you might want to read up on the impressive watchmaking history of Porsche Design… it might just change your opinion about their watches.